Home » Ag News » Farming? There’s an App for That! Smartphone apps aren’t just for social networking or entertainment. 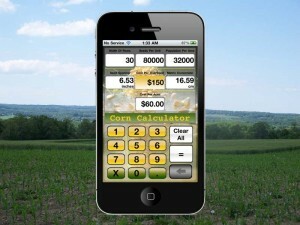 A growing number of apps make use of smartphone technology to help farmers do their job. Farmers can use apps on smartphones or tablet computers for everything from staying up to date on agriculture news to calculating sprayer tank mix ratios, said Kent Shannon, University of Missouri Extension natural resource engineering specialist. One example is Connected Farm, which lets producers collect scouting information in the field and take pictures that are geo-referenced. There are also several apps that have commodity market information. And this is only the beginning, Shannon says. New and more powerful farm-related apps are being developed all the time as smartphone usage expands and technology evolves. Shannon says producers will be able to use a tablet or smartphone to access diagnostic information on their equipment, anything from oil levels to hours run, allowing them to perform more timely maintenance. Before jumping head first into mobile technology, there are some important things to consider. Perhaps the most important one is wireless coverage in your area. Reliability of phone service and speed of Internet connections can vary greatly by location and provider. The majority of smartphones and similar mobile devices use one of two operating systems. Apple’s iOS runs on iPhones and iPads. Most of the popular competing devices use some version of Google’s Android operating system. While most carriers offer Android smartphones, the iPhone is only available through some wireless providers. Many popular apps are available on both operating systems. Though the latest high-end devices tend to be pricey, Shannon says that in today’s marketplace you can get a smartphone pretty inexpensively. Attribution:Farming? There’s an App for That!